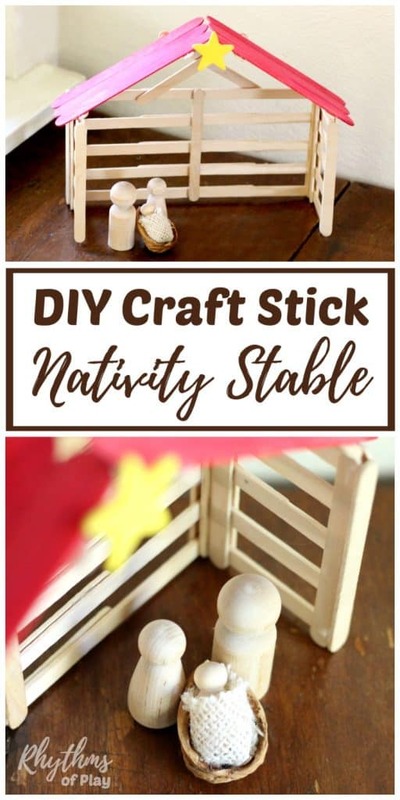 Both kids and adults will love making this DIY craft stick nativity stable. It’s a fun handmade Christmas craft the whole family can enjoy! Younger children will need help from a parent or caregiver while older kids will be able to complete this DIY project from start to finish on their own. We are using our DIY nativity stable as an element in our Simple Stone Advent Calendar, but it also looks lovely displayed as a part of a Christmas nativity scene. My preschool aged daughter and I had a great time building with craft sticks making this Christmas craft. It may seem complicated but it is super easy to make. Make sure you provide supervision and instruct your children on the safe use of glue guns before offering this popsicle stick nativity stable building activity. Please read the directions before attempting this nativity craft. It will be a lot easier to put together if you have an idea of all the steps first. The irregularities of craft sticks can make building with them tricky business. Do your best to select craft sticks that are as straight as possible. Too many crooked sticks can make this DIY craft stick nativity stable tough to complete. You will also want to construct you stable as neatly as you can. Do your best to make the craft sticks line up properly. This can be tough when you are working with glue that dries fast! 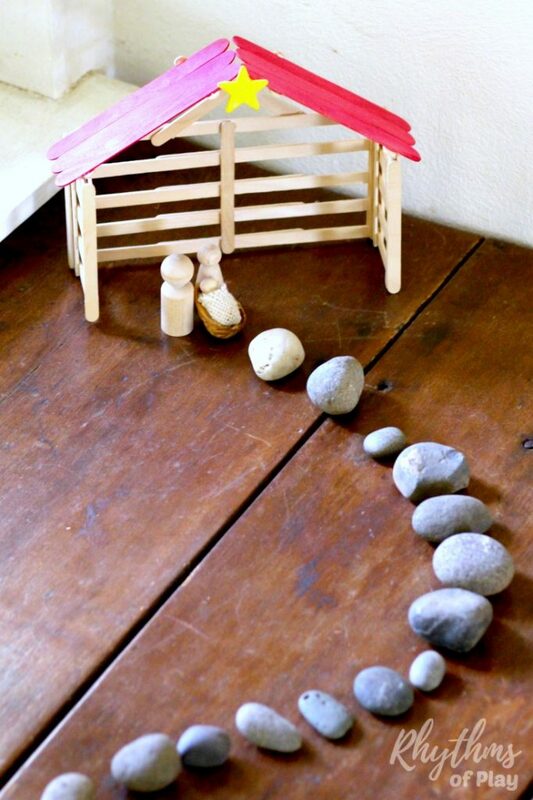 This DIY craft stick nativity stable is incredibly strong once you put it together. I thought it would be a bit fragile but it’s super solid and should last for several years if stored away properly. First, paint a 1.5 inche wooden star yellow so it will be dry and ready to glue to the stable once it’s built. 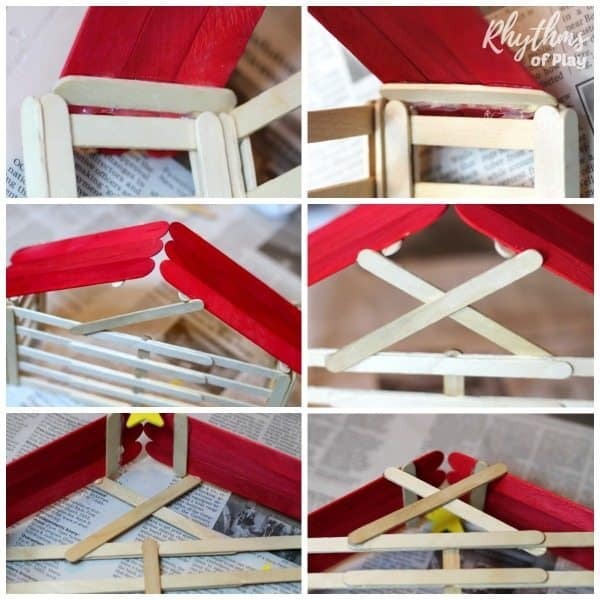 You will need 5 craft sticks, and 5 mini craft sticks for each of the two side walls. 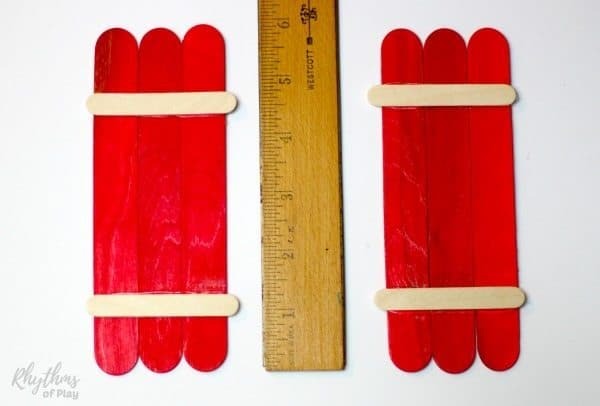 Lay 5 mini craft sticks down horizontally so that they are spaced the length of a craft stick. Keep the craft sticks on the side to keep them lined up. Place another craft stick on top of each side. It will look like train tracks. Use a pencil to place a dot where the craft sticks overlap. Place a dot of glue where you have made each pencil mark and quickly place back on top of the mini craft sticks. Do your best to keep it flush. You don’t want any of the mini craft sticks extending out beyond the overlapped craft stick. Repeat on the other side. Flip over your little train track and repeat with 2 more craft sticks on the other side. Use a glue gun to place a bead of glue along the edge of the last craft stick. Quickly attach to one side of your side wall. The other side should be left as is. It will be glued to back wall in a later step. Don’t worry if you can’t do this. It’s not needed for structural reasons. It just gives it a clean finished look. Repeat steps 1 through 6 to create your second side wall. See photos below. You will need a total of 22 craft sticks to construct the back wall of the nativity stable. Lay two craft sticks down vertically tip to tip. 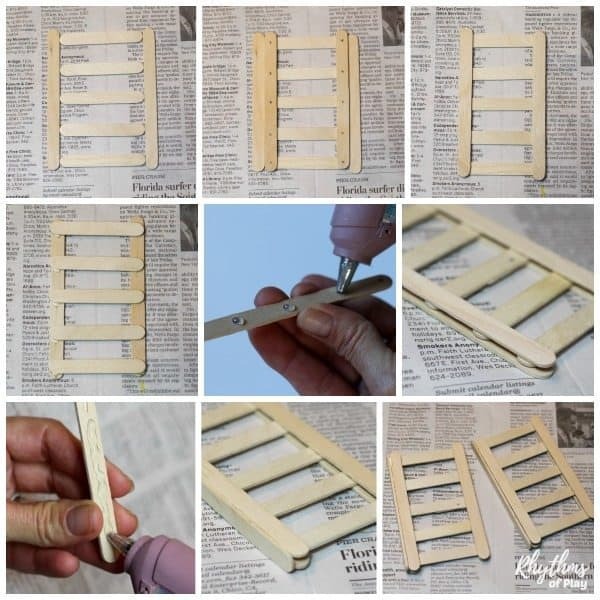 Put a dot of glue on both ends of another craft stick and lay it on the top of the craft sticks to connect them. Repeat until you have 5 of these made. 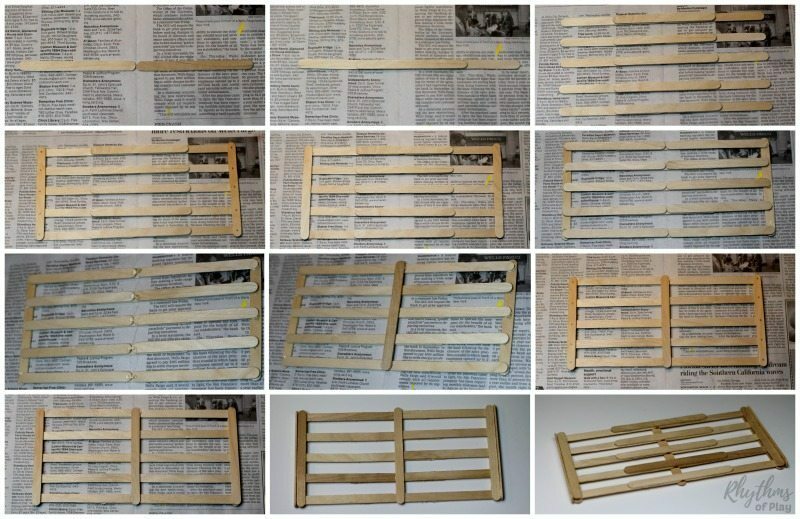 Place the completed craft stick back boards horizontally spaced the length of a craft stick. Place a craft stick on top of the far left and far right sides. Use a pencil to place a dot where the craft sticks overlap. Use glue gun to place a dot of glue where you have made each pencil mark and quickly place back on top of the craft sticks. Once again, do your best to keep it flush. You don’t want any of the craft sticks extending out beyond the overlapped craft stick. Repeat on the other side. Flip the back wall over and repeat with 2 more craft sticks on the other side. Put a dot of glue where each pair of craft sticks touches in the middle. Quickly glue a craft stick vertically in the middle of the back wall. 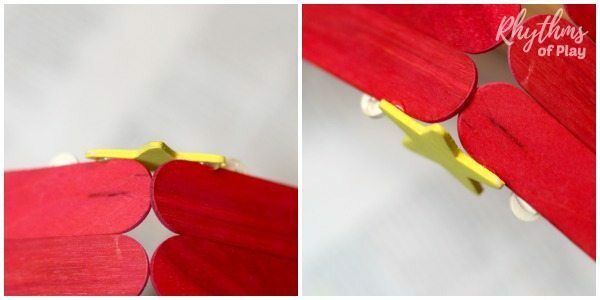 Use a glue gun to place a bead of glue along the edge of another craft stick. Attach it to one side of the back wall to cap the edge. Repeat on the other side. Lay down the back wall so the overlapped craft sticks are on the bottom and the exposed vertical craft stick beam in the middle is on top. Place bead of glue along the upper edge of one side. Attach side wall with the exposed side down and the capped side up. You will need 3 jumbo craft sticks and 2 mini craft sticks for each side of the roof. Place 3 jumbo craft sticks side by side. Using a glue gun place a bead of glue along the edge of a mini craft stick and place it about 1 inch from the end of the craft sticks. Glue the second mini craft stick to the other side of the jumbo craft sticks. Repeat steps above to make the other side. Note: Make sure you do not place the mini craft sticks to far from the edge of the roof. Where you place the craft stick will ultimately affect the pitch of the roof. If the mini craft stick is too far from the edge, the roof will not touch once it is glued in place. How you construct the structure of the stable will affect how your roof will fit, and what you need to do to make it work. My daughter and I made this craft stick nativity stable three times. We learned a lot each time we built it and put the roof on a little differently each time. I don’t have great photos because I was too busy holding on with both hands to make it, but I do have a few close-ups of the finished product that should help you figure out how to put your roof on along with the general directions below. Play with both sides of the roof turned each way on both the left and right sides before you decide how to glue it. In some cases, your roof will not touch properly to make a connected peak. Move them around to find which way they fit best. Photos showing different craft stick crossbar options described in #3 above. 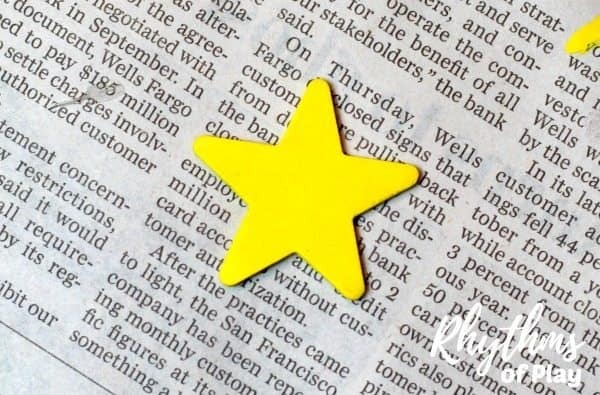 Place a dot of glue on the two arms of your star that touch the roof in order to attach it. This will both help stabilize the roof and give it a little more structural integrity. 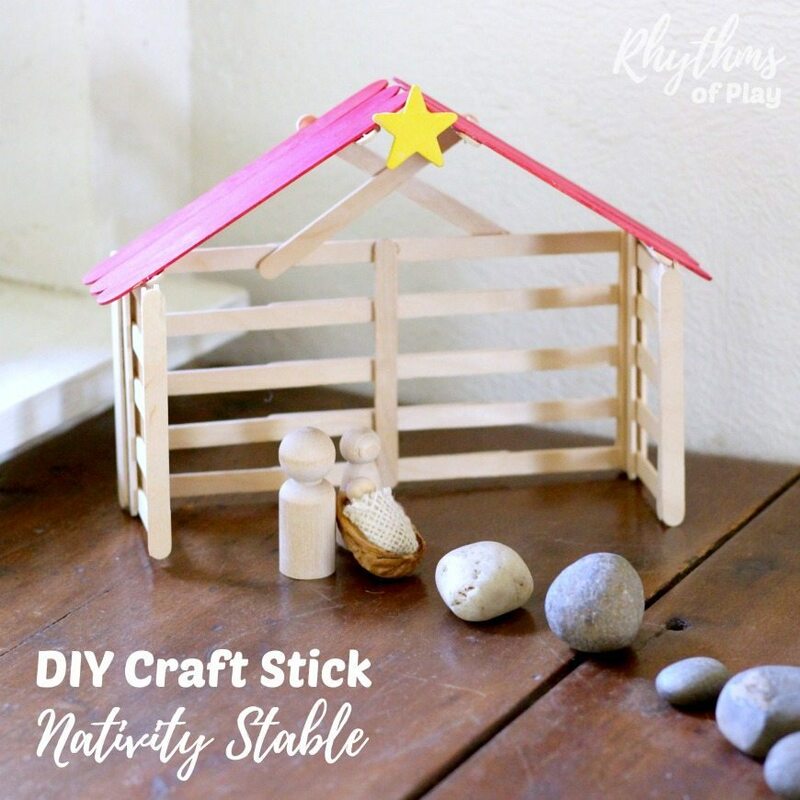 This DIY craft stick nativity stable looks lovely displayed in Christmas nativity scenes as home decor and makes a great gift idea for the holidays. We are using our DIY craft stick stable as an element in our simple stone advent. To learn how to make our easy DIY wooden peg doll holy family click HERE. 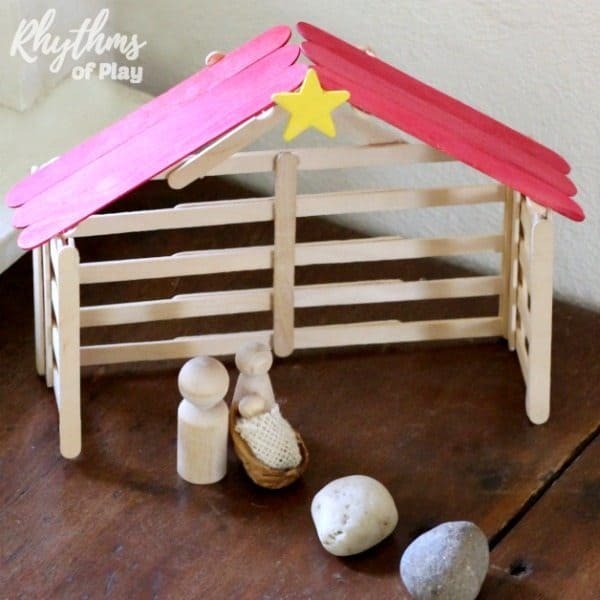 This DIY craft stick nativity stable is a fun handmade project the whole family can enjoy. Use it as an element in your nativity scene this Christmas! Don’t forget to pop over to check out Meaningful Traditions for a Magical Holiday and our Winter Bucket List. You may also like Christmas Gifts and Christmas Ornaments Kids Can Make Your family will Love! Thanks, Karyn! So glad you like it! I have many more fun craft stick structures planned now that my daughter and I have mastered engineering them. I will be sharing more fun craft stick DIY’s in the new year! I’m making this with my kids at daycare and I’m wondering what size star you used. I’m so glad you will be making this with your class! I used the 1.5-inch wooden star for this project. Enjoy! I’m so sorry I missed your comment Diane! My family was on vacation for the holidays. I hope you were able to make it. For future reference, I don’t think it matters which mini, standard, and jumbo craft sticks you use. The roof may have a bit more or less pitch, and it might be a slightly different size when finished, but it should work just fine. Hi,Seeing your share on the website gives me a lot of inspiration. It’s really great!